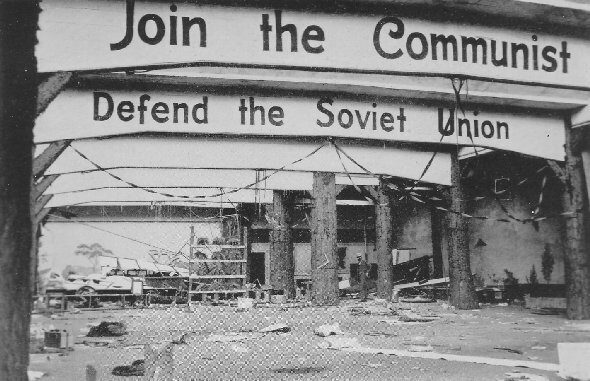 Wreckage in the interior of a Fillmore street headquarters of the communist party in San Francisco, California, after vigilantes had spent three busy days raiding and wrecking similar radical meeting places. MR. ESLICK. If your idea of the new state would come into being at once, a change from our form of government to the soviet form of government, would you pay the landowner and the merchant and the other property owner anything for his holdings? MR. BEBRITS. The landowner, the property owner, will not get anything. I hold that property owning, in my opinion, is the result of robbing generations of the people. MR. ESLICK. You would take away lands, merchandise, banking? MR. ESLICK. All of these forms of industry? MR. ESLICK. You would make no compensation whatever to the owners? MR. ESLICK. But suppose the capitalist class and individual corporations refused to give it up, then how would you take it away from them except by force? MR. BEBRITS. All revolutions are working with force. MR. ESLICK. And you would go to the extent of killing him in order to take his property, would you not, if it became necessary? MR. BEBRITS. I guess he will be wiser than to say he will stand and get killed. "History and organization.Industry in the United States has been the principal point of penetration by the communists; they have announced that if world revolution is to take place it must originate among the masses of the workers, and that in order to assure revolution and the ultimate success of their aims they must create discontent and dissatisfaction among the working people, with the hope of winning them to their cause. "The communists believe that it is necessary that they control the organizations of the working classes for the final success of the communist movement in the United States, and it has been their avowed purpose, supported by specific and exacting instructions from Moscow to capture and control all the larger labor organizations and organize the unorganized workers. "At the First World Congress of the Red International of Labor Unions, held in Moscow in July, 1921, a definite program was drawn up placing William Z. Foster at the head of the American section of the Red International of Labor Unions, with instructions to organize all the class-conscious workers in America and to have them carefully drilled in methods and procedure, as set forth specifically in resolutions passed at this congress. The procedure as outlined at this congress was the forming of minority groups in the unions and trade groups in the United States and 'boring from within' by opposing the conservative officials in the established labor organizations.